Looking for engagement rings in Brisbane? 3 Tips for the perfect proposal this Christmas. Did you know that the lead up to Christmas is one of the busiest times of the year for buying engagement rings in Brisbane? Maybe it’s due to lots of Christmas cheer or because people are more relaxed during the holidays, having the time to reassess their lives and make plans for their future. Whatever the reason, we sell lots of engagement ring in Brisbane before Christmas, whilst wedding rings are more popular in the new year. Ashley Douglas is well known for crafting one-of-a-kind engagement rings and wedding rings in Brisbane, so now is the perfect time to visit our Brisbane design studio and chat to one of our specialist jewellery designers. Once you have the perfect engagement ring to hand, you are ready to orchestrate the perfect proposal using our top 3 tips below. 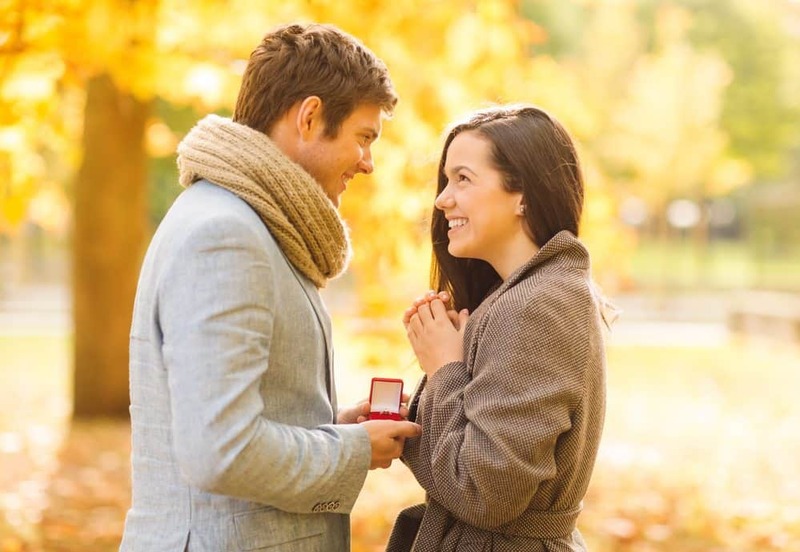 Decide on the best venue: Some women absolutely love a romantic proposal in front of their friends, family and even in front of strangers. Other women wouldn’t take kindly to this type of dramatic public display, preferring a quiet romantic dinner for two for a wedding proposal. If you want your beloved to say ‘yes’ then make sure that the venue suits the occasion. Plan ahead: You don’t want any mishaps to happen during your ‘proposal’ date, so make sure you have picked the right venue and that you have rehearsed your speech. Asking your girlfriend to marry you is always a stressful time, but it’s also a time that your loved one will always remember, so it needs to be as romantic and special as possible. Relax: If you have made all your plans and rehearsed your speech, you need to relax before the date, so that your girlfriend doesn’t become suspicious. Try to make the evening appear to be no different than any other date, so that you can really surprise her with your proposal. Of course, you can’t have a proposal without the right ring, so it pays to spend some time before your proposal researching your girlfriend’s likes and dislikes. Our most popular type of engagement rings in Brisbane are Halo rings that have a large central diamond encircled by a ring of smaller diamonds. At Ashley Douglas, we design fabulous engagement and wedding rings in Brisbane for our clients, so why not make an appointment to see us soon? https://ashleydouglas.com.au/wp-content/uploads/proposing-ashleydouglas.jpg 689 999 Ashley Tester https://ashleydouglas.com.au/wp-content/uploads/Logo.png Ashley Tester2017-11-15 06:00:262017-12-28 10:23:13Looking for engagement rings in Brisbane? 3 Tips for the perfect proposal this Christmas.